KATOWICE, 13 December - Greetings from a fast-emptying COP24. As delegates began leaving for home, the negotiations neared their climax. Ministers have largely taken over the discussions on the most politically sensitive issues, and texts have begun to shrink as more and more options are removed. We began the day expecting a new text to be issued at around midday, but there were no new developments until the middle of the afternoon, when the Polish presidency called a stocktaking plenary to hear reports from ministers who had been leading the discussion groups. We heard from the ministers leading the negotiations on finance, transparency, mitigation, adaptation, the global stocktake and the Talanoa Dialogue and IPCC 1.5 degrees special report. All of these groups reported progress, convergence on key areas of disagreement, and only a few remaining obstacles. Critically however, there was no report from the ministers from New Zealand and Chile who, the President said, had had a "very tough night". Concluding the stocktaking meeting, the President said he would focus on preparing a new set of proposals, after which he would consult with ministers in a "Vienna meeting". 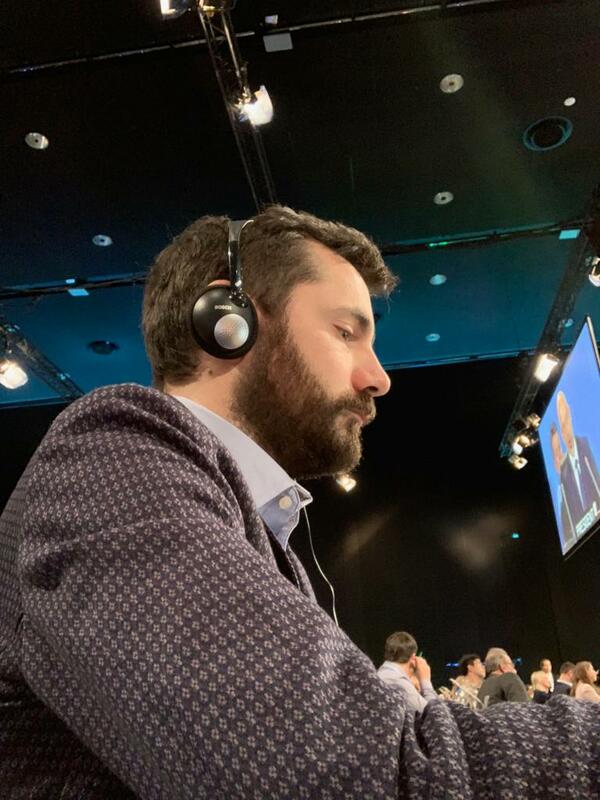 International Policy Director Stefano De Clara takes notes during the stocktaking plenary. New texts were repeatedly delayed until the early evening, when Article 6.2, Article 6.4 and Article 6.8 drafts appeared. Our policy team has been analysing them and say that they're a step forward, even if they are "not quite there yet". There are still many brackets but we believe the endgame is now near. There are still grey areas in the accounting options, and they are really complex to work through, but we think they can be simplified and improved. Most critically though, Share of Proceeds is still a big problem. We don’t think it should apply to Article 6.2, and it has the potential to put the whole of Article 6.2 at risk. Our main side event today was a session on the Carbon Pricing in the Americas Declaration. Katie Sullivan led a discussion among senior carbon pricing experts from North and Latin America and the World Bank to review the opportunities that signatories to the year-old Declaration are pursuing and the priorities for policy development. All smiles at IETA's side-event on the Carbon Pricing in the Americas Declaration. We also hosted an important session on REDD+ and how it can be supported by governments and the private sector. Finally, Gas Naturally held two sessions in the afternoon on low-carbon technologies for mitigation such as carbon capture, and then a discussion on the growing role of millennials in entrepreneurship and policymaking. We closed our side-event programme with a reception at the IETA Business Lounge, which has been a huge hit throughout COP. We are also very grateful for the support of our member organisations and others, who have put on a fascinating and really varied schedule of events. Lastly, we've also finally managed to get our hands on a link to Dirk's Talanoa Talk. In the run-up to COP24, he was invited by the 5x15 organisation to participate in an evening of Talanoa Talks in London. Amid a stellar roster of speakers ranging from Fijian Prime Minister Frank Bainimarama to actor Ralph Fiennes to singer Ellie Goulding, Dirk spoke about the value of cooperation in the fight against climate change. You can see his talk here. Tomorrow we will share any important developments, texts, or observations from our policy team. and assuming the talks end, as currently predicted, on Sunday, we will be producing a comprehensive report on the entire two weeks of COP24 by next Tuesday or Wednesday. KATOWICE, 12 December - Greetings from an increasingly intense Katowice. Negotiations continued all day, mostly behind closed doors, as technical experts continued to work on outstanding issues, while ministers supervised the discussions on more political questions. We understand that after meeting all day, some of these technical groups were to continue working until around 9pm Wednesday night. The COP Presidency indicated that the technical work would focus on baselines, corresponding adjustments, overall mitigation of global emissions and governance under Article 6.8. These issues were expected be forwarded to ministers after work ended, to join those political topics that have already been set aside for ministerial attention, including "inside/outside", share of proceeds and whether ITMOs may be used for purposes other than towards meeting NDCs. There was no new text published on Wednesday, though several iterations of documents did appear, with different titles. Kelley Kizzier (EU delegation), Nat Keohane (EDF), Steve Rose (EPRI), Jonathan Grant (PWC/IETA) and Dirk Forrister at IETA and EDF's official side event. 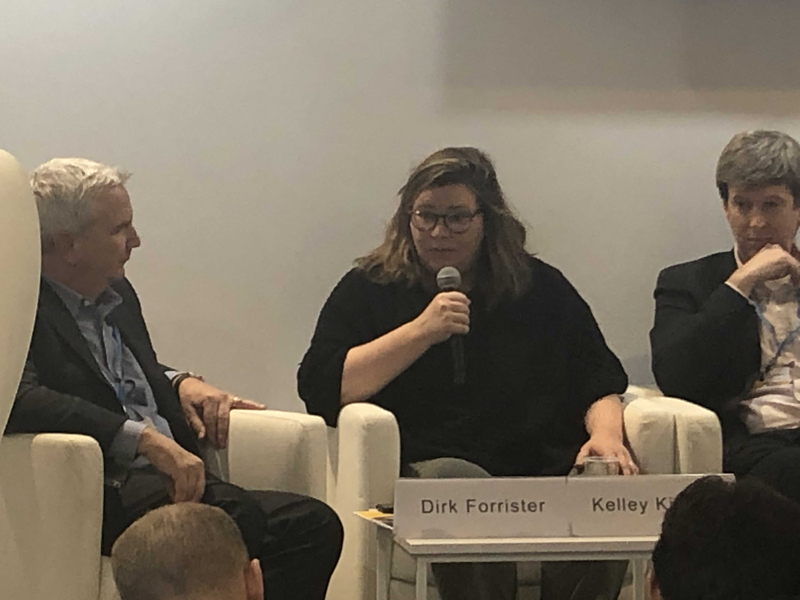 Kelley Kizzier of the EU delegation spoke at our official side event on Wednesday afternoon, and confirmed our impressions by telling the audience that "there is progress happening; there is compromise on the smaller issues, [but] maybe not on the big-ticket items." IETA's side-event programme on Wednesday was a little less hectic than Tuesday's: we began with Min Li leading a discussion on how international experiences with market mechanisms have helped China with the roll-out of its own national ETS, and revisited that topic later in the day when Katie Sullivan joined a panel discussing North American experiences and how they may help China's process. Katie Sullivan underlines business' message for the designers of market mechanisms. IETA also hosted a fascinating discussion on solar geo-engineering - technologies that reduce radiative forcing - and how it can be governed and deployed. Professor Robert Stavins of Harvard and Janos Pasztor of the Carnegie Council led the discussion. For IETA though, the day was dominated by our official COP24 side event, which we held jointly with Environmental Defense Fund. Dirk Forrister presented early results from modelling carried out by the Joint Global Change Research Institute at University of Maryland, which shows that efficient, linked international markets can drive down the cost of abatement by as much as $270 billion a year by 2030. You can watch a recording of the event here. Thursday is the final day of IETA's side-event programme. There will be just five public events, kicking off at 0830 CET with a session on company risk. EPRI will lead a discussion into how to develop a scientific basis to calculate climate risk and how it impacts companies. At 1000 CET, IETA will revisit the Carbon Pricing in the Americas Declaration and look at the policy priorities and pricing initiatives that are emerging in the various countries that signed the Declaration. At 1300 CET we will host a session that investigates the role that governments can play in mobilising finance to scale up efforts in REDD+. Leslie Durschinger, who chairs the IETA REDD+ working group, will moderate a discussion on how governments can create the conditions that allow private capital to integrate with NDC goals. The final two events are hosted by Gas Naturally; the first at 1430 CET will look at innovation in mitigation - including CCUS - and how the natural gas industry is working to play its part in reducing emissions. The final session at 1615 CET will take a look at how millennials, who are growing as entrepreneurs, scientists and even policymakers, are responding to climate change. Wednesday ended with IETA's Nightcap Party, where guests mingled above the Christmas market in Katowice's main square, while the UK Conservative Party voted to keep Theresa May as its leader for now. Prime Minister May reportedly told MPs that she will not lead the party into the next election. We will circulate any new draft texts that appear in the coming day to you all, and welcome your comments. This is to advise you that our official COP24 side event has been changed to a new time. The event, titled "Harnessing carbon markets under Article 6 to increase ambition: Lessons from research and practice", will take place at 1500 CET in the Pieniny side-event room (in Area G, a short walk from the IETA Business Hub). IETA will present new research on how carbon market cooperation can help achieve the financial and mitigation goals of the Paris Agreement. Speakers from Environmental Defense Fund and EPRI will present the early findings of their research - and Dirk Forrister will summarise initial modelling results on Article 6 by Jae Edmonds and his team at the Joint Global Change Research Institute at the University of Maryland. KATOWICE, 11 December - Greetings from snowy Katowice! After being sent back to work yesterday by the COP Presidency, the Article 6 negotiators produced a new iteration of the draft texts, which you can find here: Art. 6.2, Art 6.4 and Art. 6.8. Paul Watkinson of France, who led the Article 6 talks, said that potential landing zones had begun to emerge, "but we are not there yet." Corresponding adjustments and related matters. The COP president told negotiators that, based on the results of the two days' extra talks, "the current approach is exhausted and texts are stuck." From now on the negotiations will fall under the COP presidency's authority. New text proposals will be prepared in cooperation with experts and released Wednesday morning for ministers to work on. Article 6 talks will be run by the ministers from Chile and New Zealand. Activity at the IETA Business Hub maintained the hectic pace from Monday, with a very full schedule of side events. The agenda started with three sessions on the green energy transition.The International Energy Agency hosted a discussion on policy packages to support the transition, while Lord Stern headlined an event sponsored by the EBRD looking at how to finance the transition. 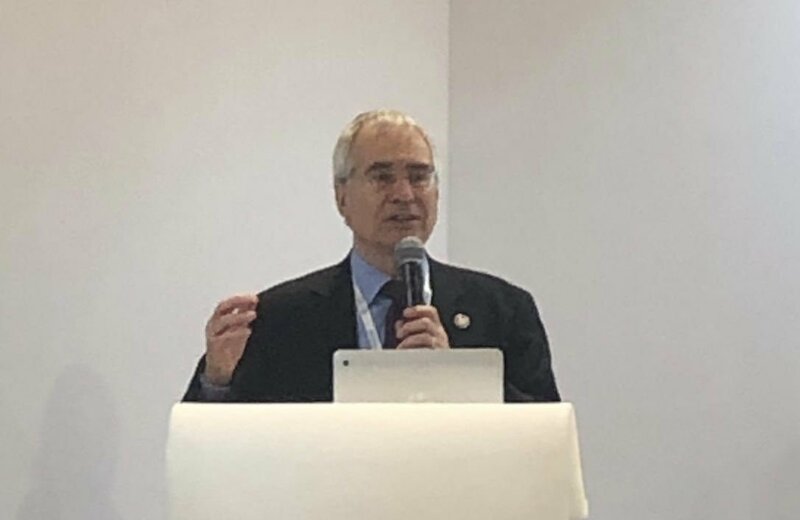 Lord Nicholas Stern addresses a side-event at the IETA Business Hub. 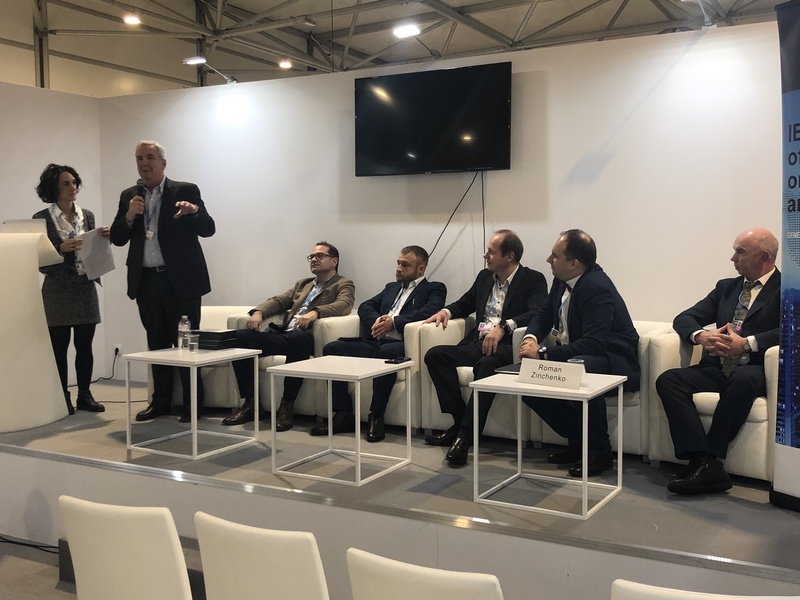 Shell then hosted a session highlighting the key technologies that will be needed to drive abatement in sectors like heavy industry and aviation. Later in the day, the Global CCS Institute examined the role that carbon capture can play, particularly in conjunction with emissions intensive industries such as cement and chemicals. The final event of the day focused on abatement from transport, with a broad-based panel from all corners of the transport and fuel industries examining the ways in which transport can meet its goals. For many IETA staff, the afternoon was dominated by the Board meeting and Annual General Meeting. We will be issuing a press release shortly to announce the new board members which we will circulate to all members. Minutes from the AGM will of course be posted on the website. IETA members gathered for the Annual General Meeting. Wednesday's schedule begins at 0930 CET with our side-event on China's emissions trading system. Min Li, our China representative, will lead a discussion into how international experiences can contribute to the development of China's market. At 1100 CET, the Harvard Project on Climate Agreements will host a discussion into the governance of solar geo-engineering, and its interaction with mitigation and adaptation. The German environment ministry will host three side-events on Wednesday afternoon. The first, at 1230 CET, will look at the growth in adoption of carbon pricing instruments to achieve NDCs. Participants will focus on implementation strategies and particularly on stakeholder engagement. At 1400 CET, a panel will discuss the benefits of including sustainable development provisions in Article 6, and what can realistically be achieved at this week's talks. The last event hosted by the German environment ministry takes place at 1530 CET and will examine how international cooperation under Article 6.2 can support otherwise inaccessible technologies. At 1645, IETA's official COP24 side-event takes place in the Pieniny side-event room (a short walk from the IETA Business Hub). IETA will present new research on how carbon market cooperation can help achieve the financial and mitigation goals of the Paris Agreement. Speakers from Environmental Defense Fund and EPRI will present the early findings of their research - and Dirk Forrister will summarise initial modelling results on Article 6 by Jae Edmonds and his team at the Joint Global Change Research Institute at the University of Maryland. We hope you'll find it a stimulating day, and it's sure to be made more interesting by the updates that will be filtering out from the negotiating rooms and plenary. Make sure you stop by the IETA Hub in between side-events to catch up on the latest developments from the talks! KATOWICE, 10 December - Greetings from Katowice! The second Monday is typically the most stressful day of COPs: the side-event programme hits its peak, as ministers and senior executives arrive for the critical stage of the negotiations. Today was no exception. 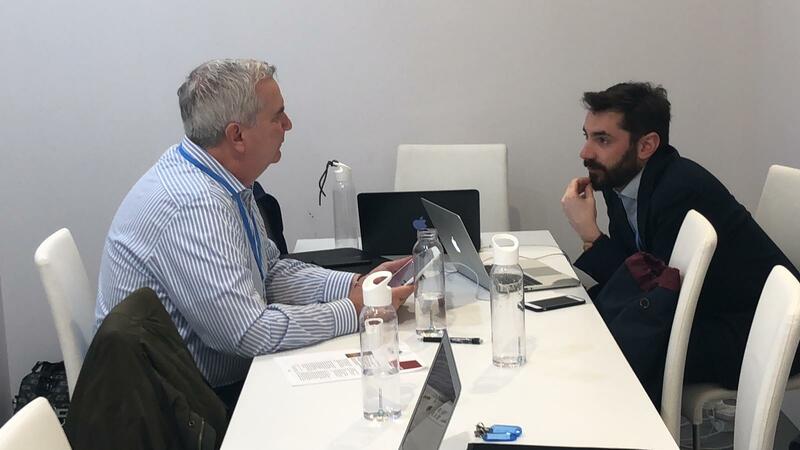 IETA hosted a packed schedule of side events at the Business Hub, while negotiators huddled in closed meetings for much of the day to try and bridge differences on a host of issues. As we noted in our email yesterday (Sunday), the Article 6 talks have grown more problematic as the number of brackets have grown and alternative options have multiplied. The COP Presidency has proposed a new procedural approach of delegating specific topics to pairs of facilitators. These pairs are tasked with clearing up the text so that Parties can reach agreement on technical issues, and forward more political ones to ministers for consideration later this week. They've been given a deadline of 1700 Tuesday to forward text to the Presidency. The COP presidency issued three documents covering the mode of work for the remainder of the week here, here and here. When the Article 6 text is forwarded to ministerial level, it will be taken up by James Shaw, Minister for Climate Change of New Zealand and Carolina Schmidt, Minister of the Environment of Chile. 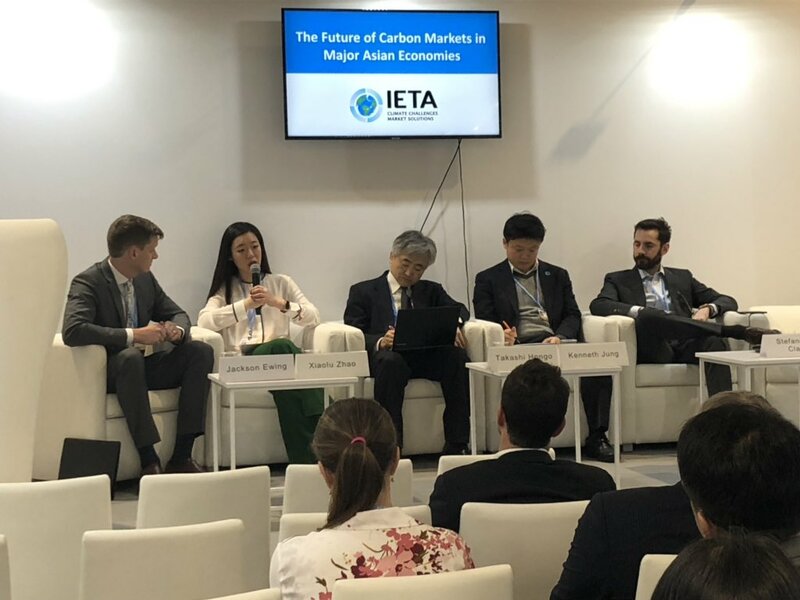 At the IETA Business Hub, we kicked off Monday with a guest appearance by Dirk Forrister at an event at the Chinese pavilion, where he outlined lessons that existing emissions markets can offer to China’s emerging ETS. 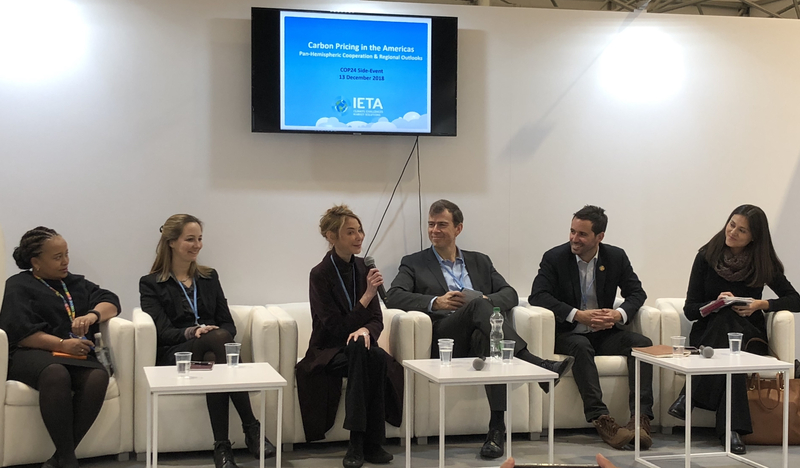 The International Carbon Action Partnership and Quebec held an event on linking emissions trading systems at the IETA hub, at which California ARB chief Mary Nichols and Quebec minister MarieChantal Chassé highlighted the experience of the WCI. Katie Sullivan moderated a panel on linking emissions markets. Our friends at Mootral presented a workshop on reducing emissions from cattle with its feed supplement, as well as a technical workshop on a project methodology. Stefano De Clara moderated a discussion on the future of Asian carbon markets, with contributions from the China Carbon Market Centre and IGES. Panel discussion on the future of Asian carbon markets. Our final event of the day saw IETA and CMIA presenting the Carbon Pricing Champion Award to Ricardo José Lozano, environment minister of Colombia, in recognition of the leadership of the Colombian government in the promotion of carbon pricing and offsetting as instruments to address climate change. 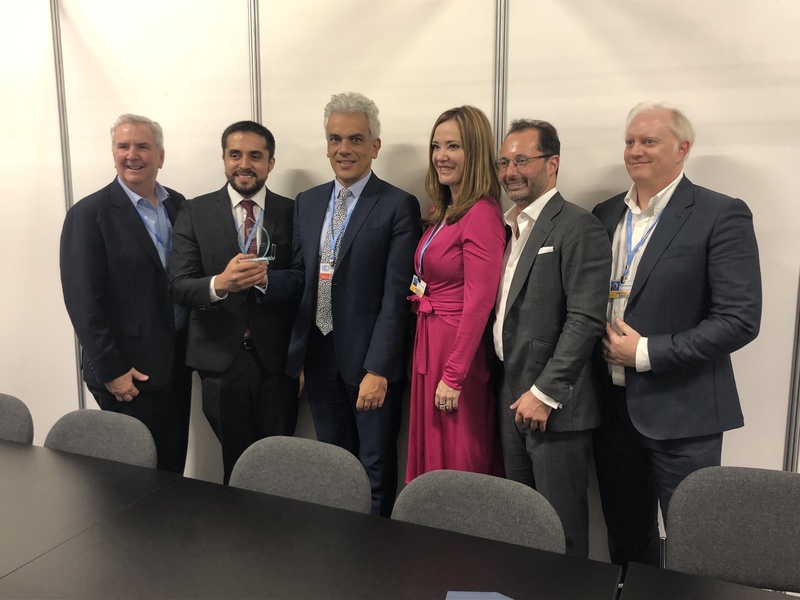 IETA and CMIA present the Carbon Pricing Champion Award to Colombia. Tuesday's programme of events at the IETA Hub starts at 0930 CET with presentations and a panel discussion led by the International Energy Agency on "Policy Packages for the Clean Energy Transition." At 1100 CET we welcome Lord Nicholas Stern to the Hub, where he will join a stellar panel to discuss how the green economy transition can be financed. The event is sponsored by the EBRD and will feature speakers from the London School of Economics, ENEL, the EBRD and the Silesian metropolitan authority. At 1230 CET Shell will host presentations on the latest thinking on technologies and drivers that are needed to trigger the abatement required. Shell will present elements of its Sky Scenario, as well as parts of the new Energy Transition Commission's Mission Possible report. Lord Stern returns to the IETA Hub at 1400 CET to participate in a discussion on Carbon Capture, Utilisation and Storage technology, along with representatives of Bank of America Merrill Lynch, BHP, NRDC and the Norwegian energy ministry. The final side-event of the day will be led by David Hone of Shell, and will explore how the transportation sector can find a pathway to a low-emissions future A large panel of experienced speakers will discuss the challenge of meeting short-term consumer expectations while still fulfilling longer-term societal objectives. IETA will hold its Annual General Meeting at the Marriott Courtyard from 1700 CET. The meeting is open to IETA members only, and will be followed by a reception. We hope to see you at some of our side-events tomorrow, as well as at the AGM. 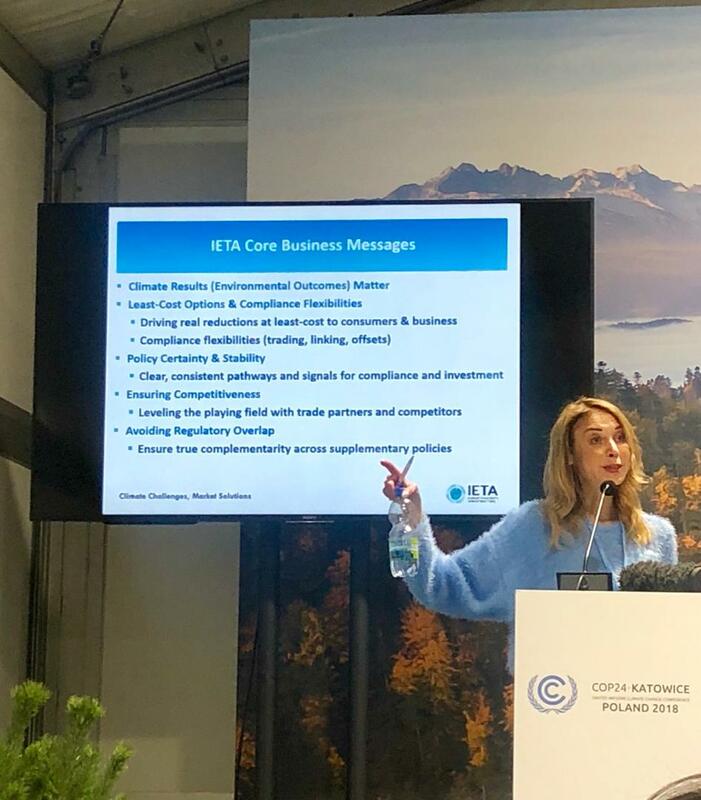 Remember, our side-event programme can be found online at www.ieta.org/COP24. KATOWICE, 9 December - Greetings from Katowice! Following our daily update on Friday, we’d like to delve a little deeper into some of the key issues in the Article 6 negotiations that we’re following. You may have read that the SBSTA plenary on Saturday failed to agree on whether to “welcome” or simply `'take note of`' the IPCC 1.5 degree report. SBSTA Chair Paul Watkinson said that he would inform the COP President about the impasse. At present, the question will be automatically added to the Agenda for next year's COP as specified under Rule 16. We expect this issue will be revisited in the final plenary, rather like the fraught moments in Paris when “should” and “shall” caused so much trouble. At the same time, Article 6 negotiations grew more problematic in the last day. The draft text became heavily bracketed, the UN technique for reflecting that issues are still undecided. In fact, the entire Article is in brackets - with many issues and alternatives appearing in more brackets. Efforts in SBSTA to bridge differences got bogged down. The Chair's goal was to get consensus on technical issues, so that the larger political issues could be given to ministers to decide. But we’re not at that stage yet. 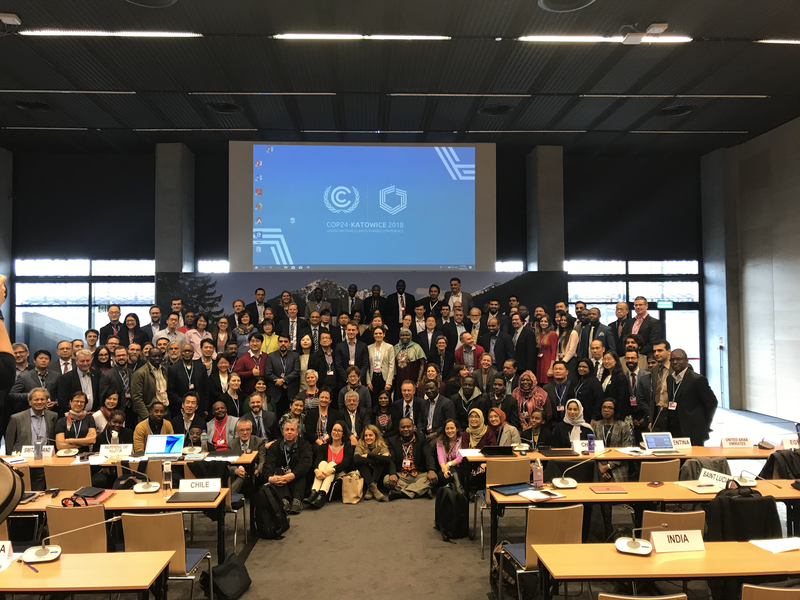 SBSTA talks came to an end on Saturday, when the various Paris Rulebook work streams submitted the outcomes of their first week's work to the COP plenary. The COP Presidency decided that more time is needed to try to unlock agreement on technical matters, including Article 6 issues. He asked Parties to continue the technical work until Tuesday night. At that point another stocktaking meeting will be held, and whatever issues remain unresolved will be forwarded to ministers. We understand that when the text is brought to ministerial level, two ministers will be assigned to each open topic. They’ll be tasked with bringing matters to a successful resolution. Over the last 24 hours, our policy team has been dissecting the draft Article 6 text and looking for potential “landing zones” where compromise and agreement may be possible. The situation is still very fluid, and there are still many moving pieces. The first element we’re watching is the definition of an Internationally Transferable Mitigation Outcome (ITMO) in Article 6.2. We’re keen for it to represent tonnes of CO2 equivalent, but some Parties are pressing for other metrics to be recognised as well. Our view is that we should start with tCO2e in the Rulebook, and then Parties can consider whether to expand the definition as part of the work programme on technical elements. We’d also like CO2 removals to be explicitly referenced in the definition. There are also different views on how to account for carbon reductions and transfers. Parties are still struggling over whether to require corresponding adjustments if reductions are made from sectors outside a country’s NDC. Equally, there is disagreement over whether ITMOs can be used for purposes other than meeting an NDC. This provision aims to provide an implicit recognition that programmes such as CORSIA could also have access to ITMOs. There are competing options when it comes to the composition and membership of anew supervisory body for the Article 6.4 mechanism, while there is also disagreement over whether Article 6.2 also needs a supervisory body to oversee the reporting and review of ITMO transfers. IETA’s view is that there is no need for an Article 6.2 supervisory body. Reporting on use of ITMOs by Parties should be evaluated as part of the reviews by technical expert teams and reported to the COP as the overarching governing body. We do, however, think that this is the time to constitute the Supervisory Body to run the Article 6.4 mechanisms. The issue of Overall Mitigation of Global Emissions (OMGE) is pitting the Small Island States against many other Parties. AOSIS is pushing very hard for transfers of ITMOs under both Articles 6.2 and 6.4 to undergo a “haircut” in which a portion of the ITMOs would be cancelled or discounted. This would come on top of the proposed Share of Proceeds and the use of conservative baselines. IETA’s view is that the overall mitigation was not intended to apply to Article 6.2. We think that for Article 6.4, overall mitigation can be satisfactorily achieved through use of conservative baselines and standardised performance crediting benchmarks. We think that an additional “haircut” is not justified. AOSIS and the African Group are also pressing very hard for a Share of Proceedsto feed adaptation funding. Finally, the transition of the CDM is being dominated by discussions over eligibility criteria for the Article 6.4 mechanism. There is a proposal rumoured to be in the works to set a “cut-off” date for projects based on when they are registered in the CDM. Older projects would be more likely to have passed through their first crediting period, while more recently registered projects may have crediting periods that extend well into the 2020s. They could have a greater claim to be accommodated by the new mechanism, although they would need to requalify for additional crediting periods. On this issue, among many others, there are still too many options on the table at this stage. We’d like to see the options narrowed down before ministers have their say on the final outcomes. Equally, we are keeping a watching brief on how the evolution of Article 6 intersects with REDD+, with finance, reporting and technology. We will continue to track these negotiations and will update you in our next Report tomorrow. KATOWICE, 8 December - Greetings from COP24! The Article 6 co-chairs announced a short time ago that a new draft text has been published. You can find it on the UNFCCC website here. If you haven't received our daily updates from COP24 and would like to, please contact me and I will add you to the list. KATOWICE, 7 December - Activity both inside the negotiating rooms and in the halls picked up noticeably today as the end of the first week approached. You may have seen in your email this morning our video report on the state of the talks, and we hope to bring you more of these as COP24 progresses. IETA doesn't have the services of a professional cameraman (or camera), but we hope something different brings more flavour of the talks! This afternoon we were very fortunate to host a side-event in which the EU’s Kelley Kizzier, one of the two co-chairs of the Article 6 work stream in Katowice, gave a broad briefing on the state of the Article 6 talks. As we know, on Wednesday the Article 6 co-chairs issued a new iteration of the negotiating text, and were expected to issue a second one around midday today. According to Kelley, this new text won’t be issued until later tonight or possibly just before the negotiating groups’ co-ordination meetings at 0800 hrs on Saturday. Some Parties had said this morning that a new iteration at lunchtime today would not be useful as they are still talking through issues. Kelley Kizzier briefs on the progress of talks at the IETA Business Hub. Kelley said the second iteration will aim to converge around brackets reflecting options, depicting diverging positions. Tomorrow Parties will start to remove those brackets wherever negotiators see “landing zones”. SBSTA closes officially tomorrow, so the pressure is on to complete as much work as possible before the SBSTA closing plenary. Once the SBSTA talks end, the text with the (hopefully few) remaining brackets will then be forwarded to Ministers at the start of week 2, and the Polish COP Presidency will manage the process going forward. Kelley also offered some insight into the discussions: this week Parties have been trying to tackle the more and most challenging issues, such as share of proceeds (for the mechanisms under 6.4 and, according to some Parties, 6.2), overall mitigation of global emissions (OMGE), baselines and additionally in the Article 6.4 mechanism, accounting for Article 6.4, and “inside/outside NDC” issues. She said Parties made it clear this morning that they want to make sure that negotiations cover broadly all of the issues or at least all of “special issues” before any new iterations are issued. "Landing zones" on some issues are beginning to emerge and Parties are beginning to shift their position. Kelley noted that there has been a general realisation that we’re not in the world of the Kyoto Protocol and its Annex 1/non-Annex 1 distinction any more, so old divisions are fracturing. Parties from different groups are finding common ground on different issues. It's still relatively early in the game, but Parties are encouragingly bridging positions on topics such as the accounting method, the treatment of mitigation inside/outside NDCs and are making the first attempts at defining what the transition for the CDM could look like. A lot of ground remains to be covered, but it is encouraging to see attempts at bridging different positions. Those of you that do not believe in such a thing as weekends during COPs, should stay tuned tomorrow morning for the release of the new text. In addition to Kelley's briefing we had a full day of side-events at the Business Hub. 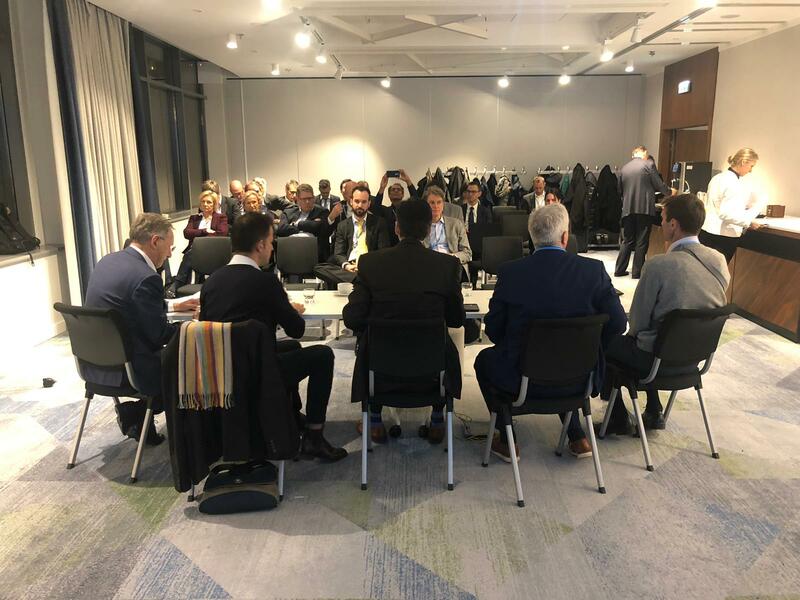 Jonathan Shopley of Natural Capital Partners moderated a well-attended workshop on increasing voluntary action under the Paris Agreement, while Simon Henry led a session on how the EU ETS can help deliver the EU's long-term climate strategy. Our first reception of this year's COP at the Business Lounge. IETA and CMIA were due to make the first of two awards to our Carbon Pricing Champions today, but the pace of negotiations meant that our first recipient was unable to join us. We're planning to make the award instead on Monday at 1520 at the IETA Business Hub side-event room, so make sure to drop by and show your appreciation to yet another pricing pioneer! As we noted above, negotiations will continue on Saturday, and there are also side events scheduled elsewhere in the COP village. Our North America Policy Director Katie Sullivan will be speaking at the US Climate Action Center at 1400 CET on public-private cooperation to advance climate action. On Monday, Mars will be hosting two side-events on private sector climate action in agriculture and in supply chains. These events start at 0830 CET and 0930 CET, and Mars will provide a welcome coffee to make the early start worthwhile. At 1100 CET, the International Carbon Action Partnership and the government of Quebec will discuss how best to link emissions trading systems. Mary Nichols of the California Air Resources Board and Kay Harrison, New Zealand's lead negotiator, will be joined by speakers from MIT, the state of Maryland, and ICAP. At 1230 CET, Mootral will host a lunch presentation and workshop on reducing cow emissions. We'll host a discussion on the future of Asian carbon markets at 1530 CET, with speakers from IGES and the China Carbon Market Center. Suncor and ATCO will host the final session of Monday at 1700 CET, focusing on the opportunities that the Paris Agreement offers the energy sector, and how driving down emissions can co-exist with economic growth. With Ministers starting to arrive early next week and the talks set to become more intense, not to mention a really busy schedule at the Business Hub, we hope you take the opportunity to recharge over the weekend! We'll keep you informed of any news as we get it. KATOWICE, 6 December - At the IETA Business Hub, the new coffee machine has been a smash hit, attracting repeat business from among our delegation (and staff) as well as a broad cross-section of observers and business representatives. Negotiations have shifted into high gear, with much of today spent working on draft texts. Our policy team was kept busy though, attending two sessions of talks among the contact groups and meeting with members and delegates in between. Article 6 talks resumed this morning with contact group discussions. Negotiators began to deal with issues of substance and key areas of disagreement, in particular proposals on share of proceeds and on overall mitigation, definition and calculation of baselines and how to define additionality. Discussions will continue tomorrow morning, and the co-chairs of the Article 6 talks intend to produce a new iteration of the texts after midday. The co-chairs are in particular encouraging Parties to try to reach consensus and develop bridging positions that might identify areas of compromise. The next two days will be very intense as delegates try to settle technical issues so that more contentious and political elements can be left to ministers next week. Elsewhere in the negotiations there appears to be good progress being made. A lot of the other workstreams are dealing with more procedural issues, while Article 6 is commonly agreed to be one of the more technical and therefore difficult elements of the Paris Agreement. Dirk Forrister presents awards at an EBRD-sponsored side event at the IETA Business Hub. Friday will be our busiest day so far at the Business Hub: we are hosting no less than six events and a reception. First up at 1000 CET will be ICROA's Fourth Workshop on Increased Voluntary Action under the Paris Agreement. We'll welcome Jochen Gassner, CEO of First Climate Markets, Owen Hewlett, Chief Technical Officer at the Gold Standard, David Antonioli, CEO of Verra, Wolfgang Obergassel from the Wuppertal Institute and Ruben Lubowski of Environmental Defense Fund. Our EU Policy Director Simon Henry hosts the following session at 1130 CET on what the EU ETS' role should be in delivering the EU's long-term climate strategy. Joining Simon will be analysts Mark Lewis of Carbon Tracker and Anders Nordeng of Refinitiv, Charlotte Wolff-Bye of Equinor and Martin Hession from the European Commission. At 1300 CET, IETA and MUFG will host a session to discuss how Article 6 and Japan's Joint Crediting Mechanism can work together. Speakers will include Kazuhisa Koakutsu of Japan's Ministry of Environment, Tatsushi Hemmi of Mitsubishi UFJ, Yuji Mizuno of IGES and IETA's Stefano De Clara. At 1430 CET, our CEO Dirk Forrister and a panel of negotiators will take stock of the progress to date of the talks on Article 6. This is sure to be a popular event, so make sure you're in the room to catch up on the latest news! At 1545 CET, GreenGoWeb will host a discussion on how to transform raw data into information that can assist stakeholders to develop services and products for governments and other groups. Our last formal event of the day will be at 1630 CET, when the Asian Development Bank leads a session presenting its Article 6 Support Facility. Full details of all the side events are in our programme: if you haven't got a hard copy, you can download a PDF here. And finally, at 1800 CET, IETA and CMIA will for the fourth year in a row present the Carbon Pricing Champion Award. Join us in the Lounge area for the ceremony and a reception, sponsored by ALLCOT and Climate Resources Exchange. If you happen to miss this event, don't worry: we'll be presenting a second award next Thursday! 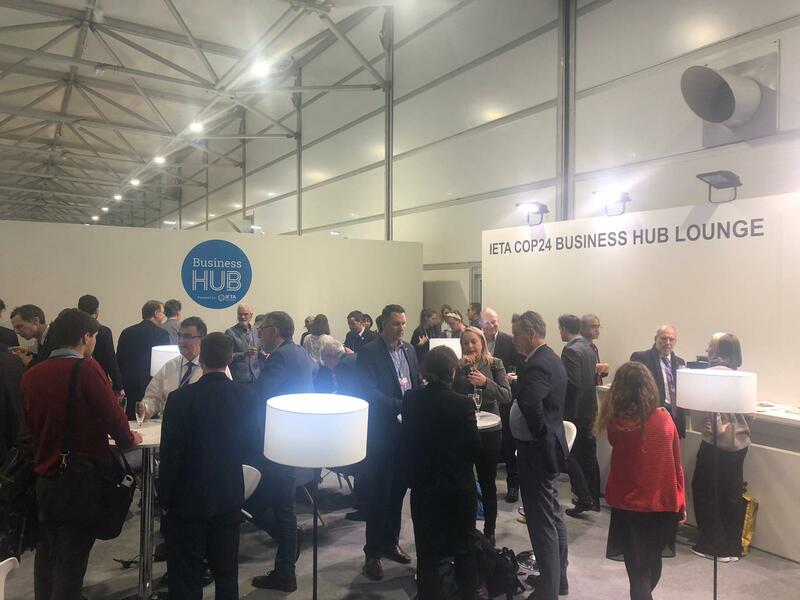 KATOWICE, 5 December - If you've already visited the IETA Business Hub at COP24 this week, you might have felt disappointed that we haven't been able to offer you a coffee - but you'll also have noticed that coffee seems to be in short supply throughout COP anyway! That's all about to change. We've installed a modest coffee machine that should be able to take care of your morning caffeine requirements. Java will be served at the IETA Business Hub Lounge in Hall H! This morning the Article 6 co-chairs published updated draft texts on Articles 6.2, 6.4 and 6.8, which you can find here on the UNFCCC website. Dirk Forrister and International Policy Director Stefano De Clara assess the new Article 6 texts. The new texts are considerably slimmer than their predecessors, and have improved the logical order of their elements. They now focus more clearly around the function of each element. Parties have been studying the drafts to ensure that their positions are still reflected in the new documents. We expect another iteration of these texts to be published in the next day or two after Parties have made comments on the content. The process will then shift to a more substantial and bilateral basis as Parties look for compromises and bridging positions, in order to deliver a clean(er) text by Saturday. Technical-level decisions will need to be made before the outstanding political questions are sent up to ministerial level for next week. Negotiations tend to be "messy" at this early stage of COP, and it's too early to be optimistic or pessimistic. However, the text is better than it was and IETA's particular priorities all remain in play, though there remain a lot of options and brackets! Once again, we had a busy day of side events, both at the Business Hub and elsewhere in the COP village. 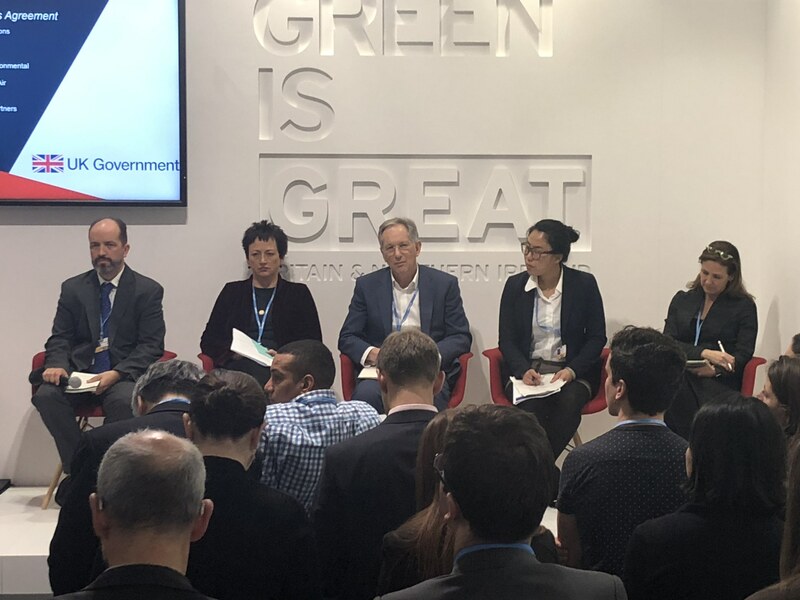 We hosted a discussion on the role of carbon capture in Nationally Determined Contributions and in 2050 emissions goals, while Simon Henry, our EU Policy Director, participated in a side-event on how to harmonise different carbon pricing mechanisms under Article 6. Together with our friends at Environmental Defense Fund, we held a very successful launch event at the UK pavilion for the Katowice Declaration on Sound Carbon Accounting, with speakers including New Zealand's lead negotiator Kay Harrison, Lisa DeMarco of DeMarco Allan LLP, and IETA Board Member Jonathan Shopley. Alex Hanafi (EDF), Kay Harrison (New Zealand), Jonathan Shopley (Natural Capital Partners), Yue Huang (IATA) and Lisa DeMarco (DeMarco Allan LLP) at the launch of the Katowice Declaration on Sound Carbon Accounting. The Declaration was supported by more than 40 companies, business groups and NGOs before the launch, and more have joined since then. We invite you to read the Declaration here and get in touch if your organisation would like to sign up. Thursday's programme of side events at the IETA Business Hub kicks off at 1400 CET with the International Energy Agency presenting its Sustainable Development Scenario. Andrew Prag of IEA and Nikki Bartlett of CDP will highlight the scenario's relevance for business. At 1530, EBRD will showcase its Finance and Technology Transfer Centre for Climate Change (FINTECC). Tomorrow is also Business and Industry Day at COP24. The International Chamber of Commerce has a full programme of events taking place in the Wisla side-event room between Halls E and H. The full programme is available here. As a consequence, there will be no BINGO briefing at 0900 tomorrow. Finally, we hope you're enjoying and benefiting from our daily reports from COP24. If you know someone who'd like to receive them, please drop me an email with their details and I will add them to our circulation list! We're also active on Twitter, where you can follow us at @IETA.